This necklace is the second in my Empress collection, a collection composed of pieces that make the wearer feel beautiful, creative, and courageous (read about the first one here). I love the color green and the mosaic turquoise that composes this necklace has a beautiful range of green, from light to dark, with a hint of blue turquoise. The focal piece of the necklace is an asymmetrically positioned black cinnabar bead with a small hematite rondelle on each side. Hematite also terminates each end of this necklace that closes with a Tibetan silver lucky fish clasp. 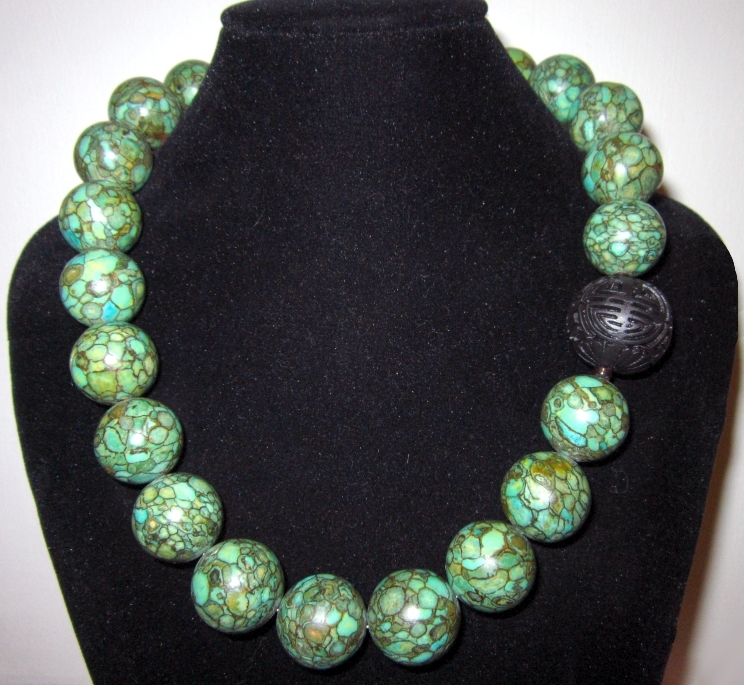 This necklace drapes beautifully and is of moderate weight. It measures 19" and its largest bead, the cinnabar, is an inch in diameter. The clasp is new and secure, so the spring mechanism may seem stiff when you first use it. After time, it will loosen while remaining secure. Buy this necklace here on Etsy!